Use the photo-sharing platform to track your customers and viewers. Then compile the Instagram analytics your business needs. Here's how. Lesya Liu is a social media strategist and a photographer. She specializes in combining art and marketing to create compelling storytelling, both visually and textually. Instagram, the photo- and video-sharing platform, is undoubtedly the hottest social media outlet on the market right now. In fact, it's doubled its user base in just two short years, to 800 million, 500 million of whom are daily users. Reports consistently show that Instagram has the most engaged community on the internet: The platform's posts receive more engagement than any other social network out there -- 84 times more than Twitter, 54 times more than Pinterest and 10 times more than its older sibling, Facebook. And all that engagement isn't limited to organic (meaning non-sponsored) posts. Three-quarters of Instagram users take actions such as making a valuable website click after looking at a sponsored post. So, marketing on Instagram should seem like a no-brainer to any business owner, right? Yet, most business owners remain hesitant to jump on the Instagram bandwagon. Even though the majority of businesses are already present on the platform, it's evident from their efforts that Instagram is more of an afterthought than a viable marketing strategy. Low-quality images and content and an overall failure to create a cohesive story line are some of today's most widespread offenses. Certainly, this is not to put all of the blame on business owners. They're busy people who want to maximize the results they get for their efforts; they want a clear purpose and ROI. So, while marketing gurus scream from the rooftops about the importance of being on Instagram, entrepreneurs are left wondering, What’s in it for me. How do I track traffic? How do I track sales? How can a collection of pretty images translate into a real revenue for a company? And then there's the biggest question of all: How do I interpret the analytics I get to ensure Instagram is an effective part of my marketing funnel? What Instagram is -- and isn't. Instagram offers you, as a business owner, the opportunity to post beautiful photos of your products and of influencers -- famous and not so famous -- using or wearing your products. It lets you include comments from customers (hopefully) urging others to buy those products.The platform also enables companies to make direct sales. What Instagram is not, however, is a selling machine in and of itself. In fact, few businesses make money directly off of their presence on the Instagram platform. Unless you’re getting paid for promotions and shout-outs, chances are you won't necessarily enjoy a clear-cut ROI from your efforts, either. However, Instagram can be a very effective part of your sales funnel, if used correctly. Like any other social network, Instagram is an awareness channel, a relationship-building channel. So, if you're wondering how awareness and relationship-building can advance your company: First, take advantage of the highly engaged Instagram community. Think of the likes and comments counts not as a vanity metric, but an opportunity to leverage, to your business's benefit, the engagement these comments represent. Then, make sure that your Instagram presence is aligned with your overall branding. That way, once people land on your Instagram profile, they can be confident that they'll again see what they've seen from you everywhere else. Once you've got those two major goals covered, follow the specific advice points below. Nathan Chan, the editor-in-chief, however, says of the magazine that it's "not growing quite fast enough." During an interview I did with him on The Social Media Current, Chan told me, "We started crushing on Instagram purely from just getting very, very good and finding out what’s working, and just consistently providing an amazing content." Of that content, Chan mentioned "having amazing entrepreneurs on the front covers of our magazines, building that social proof, also having great design [and] using social media -- like Instagram. "I think when you do great work," Chan continued, "people are going to be naturally attracted to you. You’re going to build that authority. That’s how you build your credibility. You just become an expert ..."
Tracking is your new best friend. Tracking results is where savvy entrepreneurs separate themselves from amateurs who are only going after an ego boost. What does "tracking" entail? It means having a healthy obsession with the statistics available to you through Instagram business tools, third-party Instagram analytics tools and your website analytics tools (Google Analytics, most likely). In an interview for my blog, Jessica Hirsch of @cheatdayeats suggested staying on top of trends and paying attention to industry leaders. “There’s a lot of talk about Instagram changing and adding features, so it's important for both personal and business accounts to evolve and grow with it," Hirsch told me. "I do my best to test them out, and before I know it, it becomes part of my new routine. And I think Instagram sort of rewards accounts that adapt well to the changes. "I think it’s important to move forward with that mindset and understanding to continue to grow on Instagram,” Hirsch added. 3. Pay attention to the growth of your audience. Prioritize quality over quantity here. Play by the rules and don't risk your Instagram presence by buying followers on Instagram or involving bots. Make sure that the people following your brand are the right audience fit. Does your Instagram following overlap with your business-target audience? If your ideal audience is middle-aged men, then "likes" and "follows" from young females won’t translate into sales in real life. A quick look through your follower list should give you a pretty good idea whether or a not a scenario like this is the case. If you do sign up for (or convert your existing profile to) an Instagram business profile, you’ll be able to get most of the analytical data you need without leaving the app. Instagram (contrary to popular belief) wants you to succeed, because if you win, it wins. That's why the platform is eager to provide you the insight you need to make better content and business decisions. So, explore your audience demographics, such as age, gender and locations; see when your audience is the most active on the platform. Enjoy high engagement levels that will help you leverage the Instagram algorithm, thus creating even more exposure for your content. Not only will you deepen existing relationships, you'll cast a much wider net with a little help from the platform itself. How? Through leveraging the notorious Instagram algorithm to your benefit! (notorious because people don't like the non-chronological order of its newsfeed). Again, Instagram is not after you. It's in the platform's best interest to show engaging, relevant content to its users, so that they stay longer on the platform. That's why the algorithm’s only job is to scour through the platform and find awesome content, which will be shown to more and more people. What started as a three-month-long European sabbatical with her boyfriend (now husband) Jacob Taylor turned into a blog about their amazing travels. "There was no strategy when we first started our Instagram," Selena Taylor told me in an interview. "The plan was to share photos from our adventure with friends and family, but since we both love photography, it quickly turned into a passion project for the two of us. It wasn’t until we used hashtags for the first time, and our photo was reposted within minutes by a larger account (@dametraveler), that we started paying attention to the potential Instagram had to reach others who were traveling or wanted to travel. Selena and Jacob found ways to improve their photos and style while simultaneously interacting with others who were on the road; and, "Things just grew from there," Selena said. 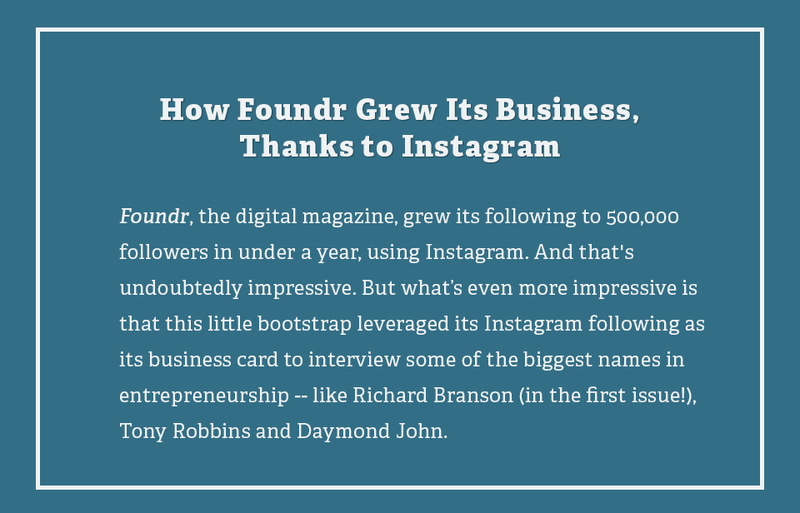 "When we started our Instagram, no one was using the word ‘Influencer’!" But then things heated up: The couple was first approached by sponsors when their account had around 10,000 followers. These days, the duo satisfy their wanderlust while making money through strategic partnerships with big brands. Continued Taylor: "It all depends on the project, but typically our trips are sponsored in exchange for promotion, or we’re hired by a hotel or tourism board for paid photo and video projects. "It’s really important to us that we feel passionate about the place and the content we can produce," she told me. "We’re also always considering our audience -- will they respond to the content and the destination? Our favorite compliment is when people tell us they were inspired to go somewhere that they never would have thought to travel to." However, the couple wouldn't have been able to earn income through sponsored blog posts and Instagram posts if they hadn't been very clear on their audience and the aesthetics of their own brand, Taylor said. She described "a lot of pressure" to constantly produce more, "but we’ll always prioritize quality over quantity." What's happened since has been the couple's ongoing effort to improve their photos, share guides from the cities and countries they've visited, guest-blog and create videos. "We fell in love with the creative aspect of what we started together," Taylor said. To get in on this, pay attention to Instagram's "Explore" section, where Instagram curates images relevant to the viewer's interests and the handles he or she is following. This is also where all of the best content is displayed, though you might have noticed that not all posts have thousands of likes. Instagram's updated algorithm now customizes your Explore section to your interests and finds handles of all sizes to show to you. In short, get to know Instagram's algorithm by leveraging the information that the network provides. Post content that provokes engagement from the right people at the right time, i.e., when they’re on the network. What’s even more important to track is the traffic flow going from Instagram to your own channel. While Instagram is an awesome platform, you don't own it; thus, your business presence and following there is at the mercy of the next algorithm change. So, be strategic and try to direct as much of this Instagram traffic as you can to the channels you do own and have control over. Send visitors to your website. This will take some effort on your part: If you simply insert your website URL into your Instagram bio, you're missing out on a lot of insightful data. Here are several moves I recommend to gain the insight you need from Instagram analytics. 1. Build a special landing page. This is a page created specifically for people to “land on,” meaning the first page they see on your site. Home pages tend to create an aerial view of the company, with tons of links going in multiple directions. Keep in mind that these people have already had a first touchpoint with your brand on Instagram, and that they clicked on the link to learn more. Plus, remember that Instagram traffic is mostly mobile, so ensure a pleasant mobile experience on your mobile page by not cramming a ton of stuff onto it. Make it as clear as possible what you want your visitors to do. You can do this through a brief email sign-up form, to continue the conversation with them and build a longer-lasting relationship, which in turn may open up opportunities for direct sales. Your landing page also needs to have a unique URL not found in any other way, except for a link in your Instagram bio. This is how you'll know that all of the traffic coming to this page is, in fact, coming directly from Instagram. And, that will tell you exactly how many people clicked on that link. 2. Include a trackable link. What does this achieve? When you go into the Acquisition tab in your Google Analytics, you’ll see traffic acquisition from all sources, including what percentage of it is social and what percentage comes from Instagram. Once users switch between applications (from Instagram to an internet browser in this case), the technology will strip away the data that comes with it. It will count Instagram traffic as “direct,” meaning it had no referral source, when in fact the visitor was referred from Instagram. See now how you could have been unfair to Instagram as a marketing channel this whole time because your analytics did not give this platform a proper credit? So, what exactly were those visitors doing at your site? Through the combination of a special trackable link and an exclusive landing page, you'll see exactly what Instagrammers are doing on your website. Not only will you know how many people came from Instagram, but you'll be able to see how long they stayed on any given page. You'll also see whether they took any next steps, and which links engaged them most. From there, you can track visitors' engagement and behavior by how much time they spent on a given page, whether they clicked anywhere else on your website and what the bounce rate was (the percentage of people that left the site from the same page they entered, without engaging with the content on any other page). And, now, that sweet word for every entrepreneur ... sales. You can then use all of this insight to work backwards and polish your sales funnel. If fewer people from Instagram are visiting your website than you would have liked, you'll need to craft a more engaging Instagram profile bio for your business and a more enticing offer for them to click on. What's important is, if they do come to your landing page but don't spend enough time there, or go anywhere else on your site, you'll know you have to rework and optimize your landing page. Conversely, if people do spend a lot of time on your site, engaging with it and reading different pages without converting into paying customers, you'll know you'll need to polish your sales message. That way, you can focus on addressing those visitors' hesitation, or simplify your sales funnel and make things more straight-forward. Interestingly, website behavior can also hint at what your followers on Instagram want to see more of when it comes to the content you produce. 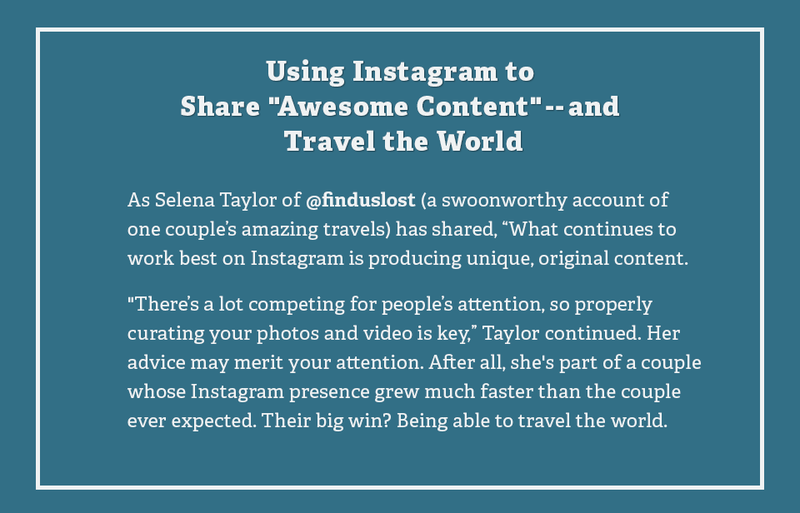 Taylor, of @finduslost, shared this process with me, writing that: “When it comes to Instagram engagement, we’re always paying attention to what is resonating with our followers. I check our Google Analytics daily to analyze our blog traffic and the channels our readers are coming from. Checking your Instagram analytics every month. Once you’ve completed all these steps and put a simple process into place for the behavior analysis I just outlined, you'll see the traffic you get from Instagram, the quality of this traffic (how engaged these people are) and, finally, the means for calculating the conversion rate at which this traffic converts into paying customers. Do this calculation at least monthly to gain a clear picture of your Instagram performance. With this process in place, you'll gain an understanding of the areas that need optimization to improve your metrics -- whether that means higher traffic volumes, more engagement on your website or an increase in sales. Once you know these metrics and how much money your business made directly from visitors who came from Instagram, you can easily justify using this platform as as an effective business tool. In sum, Instagram may trick many business owners into the perception that it's a simple tool, that it's cutesy or even juvenile, but this couldn't be further from the truth. Instead, as a business owner, you should recognize how this platform can provide you with an immense exposure to the right people. You just have to find them and strike up a conversation that will enable you to take them through your sales funnel. Then, once you begin to track results, you'll find that marketing on this platform will become almost effortless. With the rich insights you'll gain from your Instagram analytics, you'll begin to see Instagram marketing as a constant feedback loop, where you gain more understanding of your audience members and their content needs, which in turn will bring more traffic to your website and (hopefully) a bunch of new conversions of your visitors into actual paying customers.